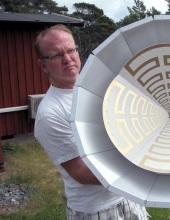 Leif is involved in the development, integration, testing and maintenance of the radiometers, receivers and antenna systems with surrounding equipment for radio astronomy at Onsala Space Observatory, and has also participated in the development of systems for other projects like SEST, APEX, ALMA, LOFAR, SKA and VLBI2010. He has a long and extensive knowledge in the development of systems for cryo & vacuum technology, radiometer technology and VLBI technique, he works closely with partners from other universities & institutions and industry, both nationally and internationally. There might be more projects where Leif Helldner participates, but you have to be logged in as a Chalmers employee to see them.